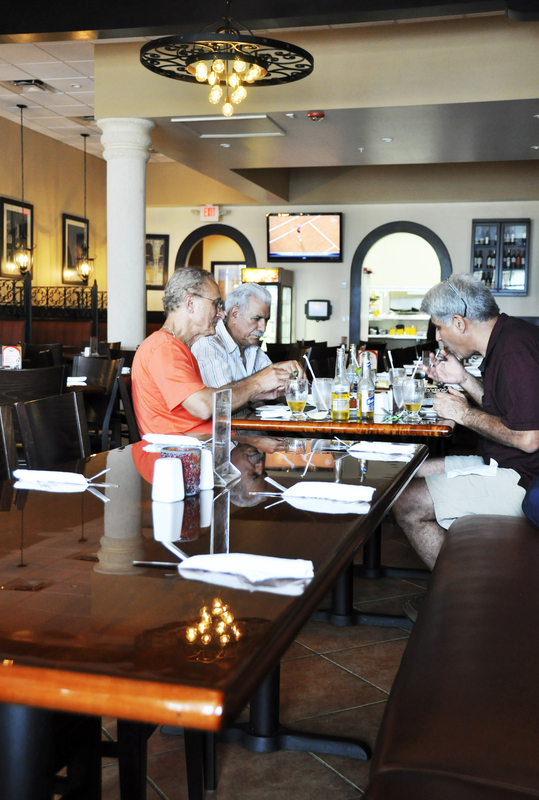 Located in a strip mall close to where we live, this little gem is the ideal place to have a taste of Mediterranean fare. Issa, Yasmin, Miss G. and myself decided stop in and have a mini-feast, as this type of food is not easily found in our neighborhood. The first dish sampled was the Gambas al Ajillo: large shrimp sautéed in extra virgin olive oil, garlic, wine and crushed red pepper. 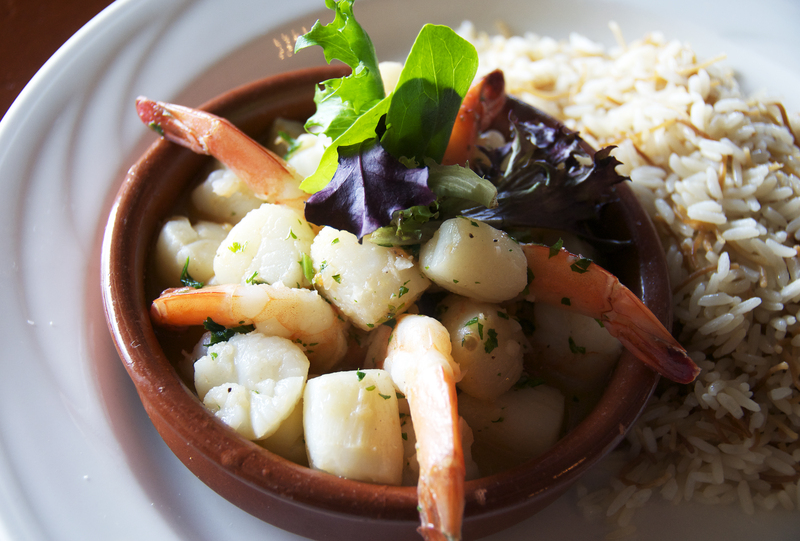 It was both delicate and delicious, the shrimps plump and fragrant with the aroma of garlic. The Buñuelos de Bacalao were another treat; golden cod fritters served with an Aïoli and a Romesco sauce. Romesco originated in northeastern Spain and it is made with roasted red peppers combined with ground almonds, olive oil and vinegar to make a smooth, rich sauce. These fritters charmed our senses with a fragrance that reminded us of home where we make cod fritters in another form. The next dish was a bit shocking. Everyone at the table looked at it in disbelief. 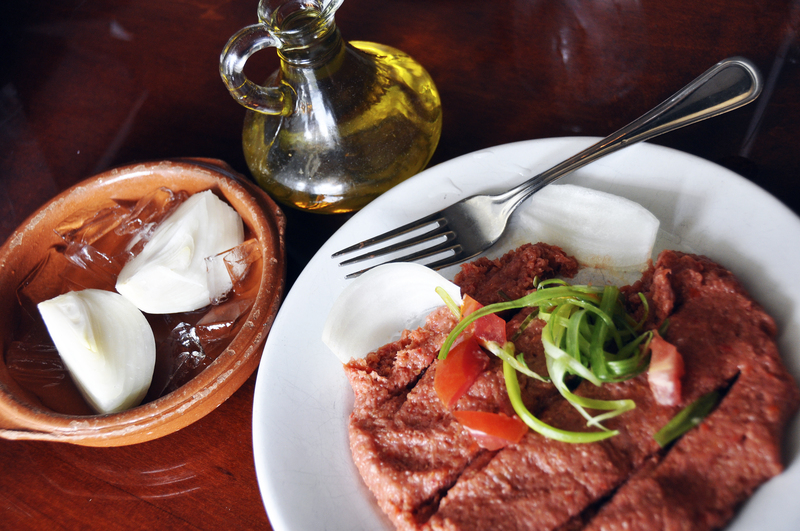 Kibbeh Nayeh is raw meat, finely ground and mixed with cracked wheat shells, onions & spices. At first glance it just looked like ground beef right out of the package one gets at the supermarket. It was accompanied with raw white onion that was covered in ice cubes. I was the only one brave enough to try it. I honestly did not know how to eat this and asked the server for advise. “ Take the onion and use is as a spoon for the kibbeh”, she said. I did as instructed and could not help sneezing after the second bite, the juices of the onion went straight up my nose. There was pita bread on the table and I decided to combine some pita, some olive oil, some onion and some kibbeh in one bite. It was ambrosia and I must confess that it felt a little odd enjoying the flavor and texture of totally raw meat. Kibbe nayyeh or raw kibbeh (also kibbee, kubba, Arabic كبة نية or كبة نيئة) is considered to be a traditional dish originating from Lebanon. Next came the Vieira y Camarón Marbella that was jumbo shrimp and sea scallops sautéed with tomato, scallions, garlic and lemon in a white wine sauce. Oh my, we were in seafood paradise and fighting over the scallops, practically gobbling this dish in minutes. 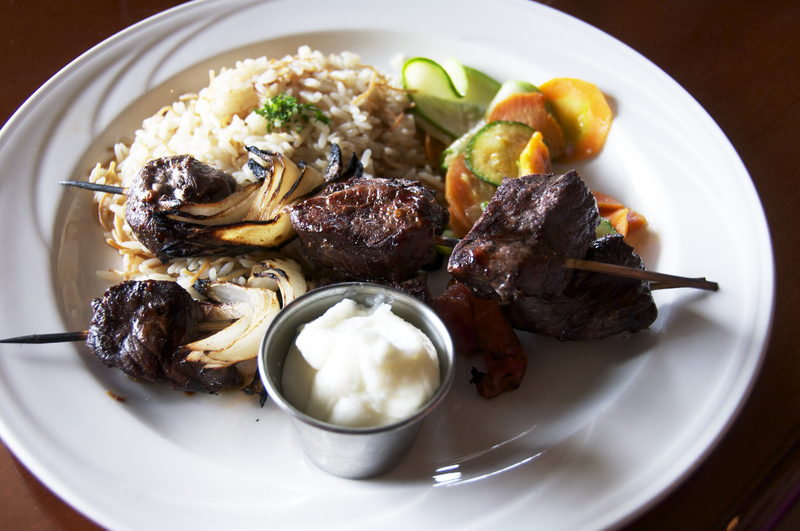 Miss G. had a craving for a kebab and ordered the Lamb Kebabs. As she took the first bite, I saw the disappointment on her face. “The flavor is good, she said, but the meat is not cooked as I asked.” Indeed, the size of the meat was not even, so some pieces were overdone and others underdone. I took a bite and had to agree. The garlic sauce though, was another story. It was so good that it was taken home. Greek Fries were also a novelty. The fries were showered with lime juice, Feta cheese and fresh parsley and this blend of flavors was unconventional, surprising and tasted really good. 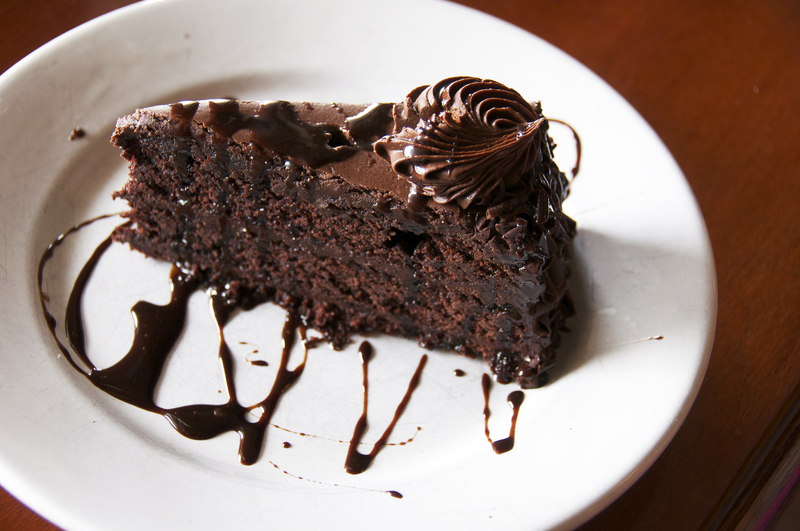 For dessert, we shared a rich Chocolate Ecstasy Cake that was just superb; one taste was more than enough as space was becoming limited in the tummy. 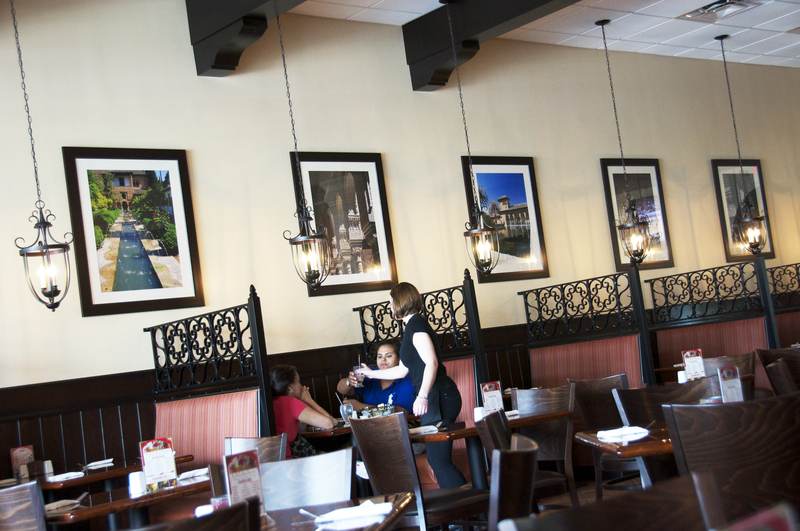 Alhambra Restaurant also delivers and offers lunch and dinner specials on weekdays. Belly Dancing and Hookah (an instrument for smoking flavored tobacco) are featured on weekends. The ingredients used are fresh, the service amiable and the mood and music inside exotic and familiar at the same time, a little treasure less than five minutes away from home.